Hi there awesome sketchbook-loving friends! Summer is in full swing here in Dallas, TX. And ever since we moved out into the city, I’ve had more opportunities to get out and experience all the different cacti around the area. I could be biased, but I can definitely say that the Dallas’s 🌵cactus game is strong. Seeing so many of these prickly friends around inspired me to sketch them. And while the cactus can get a bad rep for being a little unfriendly ;), I found a really easy and approachable way to sketch it with watercolors. *Be sure to have a sketchbook that at least takes a light wash, or is specifically for watercolor painting. Your experience will be that much more fun if you can play around with water and colors, without worrying about the paper buckling. 2. After you’ve sketched your initial shape with all the cacti ears that you can fathom, load up your brush with a darker shade of green. Go over some of those cactus ears on the very edge. This creates a shading effect and helps your cactus look more realistic. You can start by adding a very highly color-saturated brushstroke and then using water to spread that out into the shape. 3. Add cactus flowers by doing tiny line brushstrokes. Go light at first and then you can add more color on your second round. 4. At this point you can wait for your sketch to fully dry before doing the next step, or you can experiment. If the sketch is still a little damp, and you start adding the cactus needles, your dots, they may spread into the sketch. If you want a more controlled look, where the dot is contained, you should wait for a few minutes till it dries. Add the needles all over your cactus. 5. 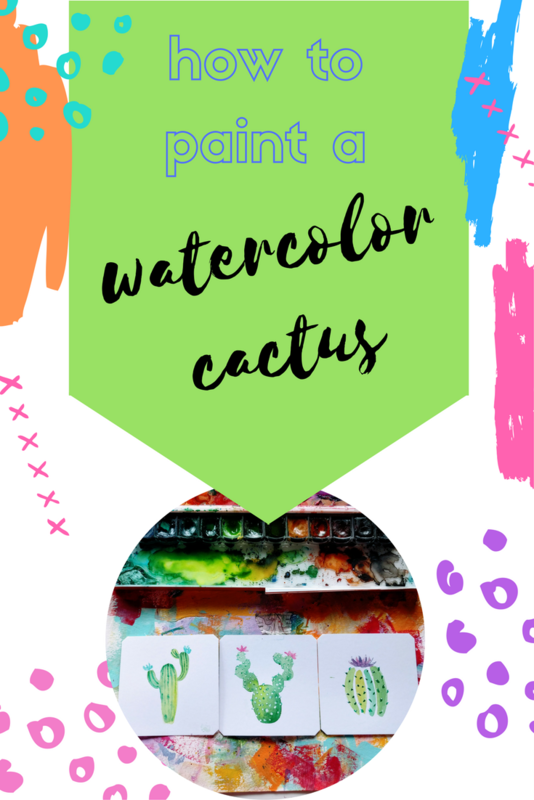 Once your watercolor cactus sketch is completely dry, grab a white gel pen or a posca marker and add in your white dots. This technique accentuates the needles and gives a more realistic cactus look, with defined needles. 2. After you sketched as many cacti arms as you want, load up your brush with a dark shade of green and start adding your needle lines. Similarly to the cactus above, if your sketch is still wet, the lines will bleed a little. I didn’t mind this effect because it makes my sketch more interesting. 3. Add your flowers to the tips of the cactus arms. 1. Start with a brushstroke that starts thin, gets wider and then finishes thin. Imagine you are sketching an oval shape composed of several brush strokes. In my sketch I went over some of the strokes because I wanted them a bit darker. 2. Start adding your flower brush lines, one by one. Add in a deeper purple for the back petals for a more realistic cactus look. 3. Wait for your sketch to dry before adding tiny and controlled lines for the cactus needles. 3. Make a desktop or mobile wall paper.